You will be given a Free reference e-book to read which has 722 pages And the test will be based on that e-book. The MCTS Microsoft Windows Vista Client Configuration certification test aims to assess your ability in the field of configuring Microsoft Windows Vista. Upon measuring your ability in the field and realizing that you have adequate knowledge, you will receive an MCTS Microsoft Windows Vista Client certification useful in attesting that you really have what it takes to become a real expert in this specific field. But note that just like any certification exams, there are lots of topics that you need to completely understand if you want to have a more convenient time effortlessly passing the test. Among these topics are the basics of upgrading and installing Windows Vista that usually cover hardware requirements identification, clean installation performance and troubleshooting installation issues associated to Windows Vista. Gathering more extensive information about everything related to the configuration and troubleshooting of the most valuable post-installation system settings, Windows security features configuration, network connectivity configuration, Windows Vista applications configuration, Windows Vista systems maintenance and optimization and mobile computing configuration and troubleshooting are also essential when attempting to become more knowledgeable about the field, thereby letting you easily pass the test. Luckily, Brainmeasures free MCTS Microsoft Windows Vista Client Configuration practice course is now around to help you deal with all the challenges associated to fully understanding the entire field. Its free study guide will be around to supply you with sufficient information about every topic linked to configuring Windows Vista while its free practice test is extremely valuable in your attempt to make all the essential exam preparations. 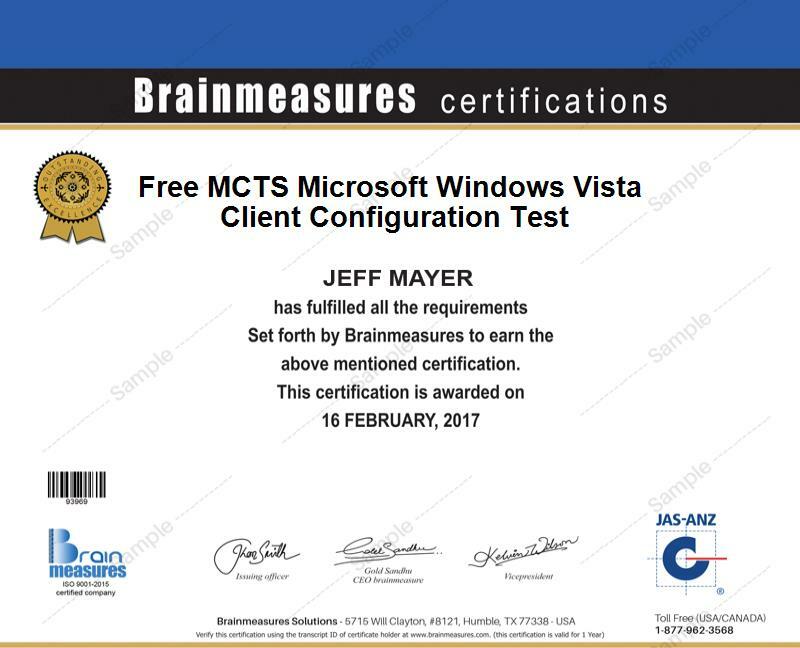 The free MCTS Microsoft Windows Vista Client Configuration practice course accessible at Brainmeasures also features a free MCTS Microsoft Windows Vista Client Configuration test that makes it really essential for those who intend to gather a more extensive background about the whole field. With the help of the free study guide which is also considered to be one of the most impressive features of this practice course, it would be easier for you to sufficiently supply yourself with knowledge on the steps, methods, procedures, issues, protocols and any other aspects relevant to the effective configuration of Microsoft Windows Vista. Taking up the practice course will also enable you to access a free practice test designed to help you generate a general and clearer idea about how the actual certification exam is conducted and how you can make yourself fully prepared for it. How to effectively configure Windows Vista desktop? How to effectively configure network connectivity? How to configure the best applications for Windows Vista? How to troubleshoot any issues encountered by Windows Vista? The free MCTS Microsoft Windows Vista Client Configuration test included in the free MCTS Microsoft Windows Vista Client Configuration practice course is really valuable in maximizing the level of your knowledge about the field. You can actually expect the free practice course including its study guide and practice test to be really useful to all IT, network and system professionals who want to focus their specialization on using Microsoft Windows Vista. Being an MCTS Microsoft Windows Vista Client Configuration certification holder is also valuable when it comes to increasing your annual earnings. By receiving this certification, you can work as an effective Windows Vista Client Configuration Administrator and reward yourself with an average yearly salary of $61,000. You will also find working as a Windows Vista Client Configuration Consultant rewarding because this profession can offer you approximately $52,000 to $129,000 yearly.